The Summit Century routes are set in a challenging alpine environment. As you pedal through some of the most breathtaking scenery you’ve ever seen — and pedal up some of the most relentless climbs you’ve ever ridden — keep in mind if you decide you simply can’t climb any more, the start/finish is only a downhill away…. The Super Century is a 135 mile, 16,500 vertical foot challenge for experienced riders – the equivalent of a Tour de France mountain stage! Four significant climbs dot this ride: riding on lightly trafficked rural roads, you’ll wind to the top of Parks Creek Summit (6,854′); up a stunning river gorge to Mumbo Summit (6,300′); through forested roads up to Castle Lake (a mountain cirque at 5400′); and finally, a breathtaking 14 mile climb up Mount Shasta’s moderately graded (6% average) forested roads (7850′). Views of Shasta, Mt. Eddy, Castle Crags and even Mt. Lassen abound. Not sure if you’re ready for this challenge? Our route forms a cloverleaf, so you can bail out at any time and only face a short ride. Time to test yourself! *Caution* Event rides are intended to only be ridden during the supervised event. The routes below may contain hazards that are only made safe by event staff. For example, some routes may be high-speed traffic corridors, with no shoulder, that are closed to motorized traffic for the event. Further, some routes may be through private property that only have a public right of way access during the annual event. These routes are intended to only inform riders whom are planning on attending this event. To ride these event routes without event staff supervision is to ride at your own risk. 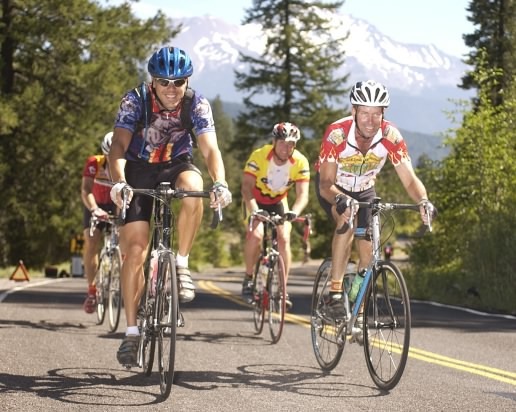 Siskiyou Scenic Bicycle Tour - 2019 May 4th -Yreka, California.